The vessel will be able to hold 1,500 cars and over 300 trucks. 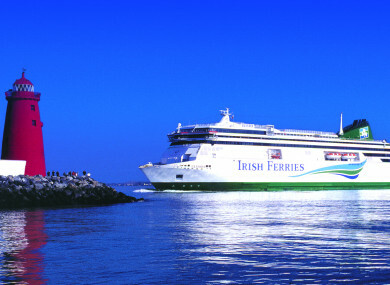 IRISH CONTINENTAL IS investing more than €160 million building a new ferry that will serve its Dublin-Holyhead route. The company announced this morning that it has entered into an agreement, with Flensburger Schiffbau-Gesselschaft & Co, for the German company to build a cruise ferry for the Irish firm at a contract price of €165.2 million. The cruise ferry will be able to accommodate 1,800 passengers and crew. Once finished it will be the largest cruise ferry in the world in terms of vehicle capacity, able to hold 1,500 cars and over 300 trucks. The new ship will replace the MV Ulysses, which is currently servicing the Dublin-Holyhead route. It will allow for a 50% increase in peak freight capacity. The company said that the move will free up the W.B. Yeats, which is due to arrive in mid-2018, to be used full-time on the direct Ireland-France route alongside the MV Oscar Wilde. The new cruise ferry will adhere to ‘ice class’ specification, which means that it can operate over a broad geographic area. The ferry is scheduled for to be delivered before mid-2020. Irish Continental said it intend to use credit facilities to finance the ship. A fifth of the contract price will be paid in instalments during the construction period, while the balance will be paid once the vessel is complete. Irish Continental said that the new ferry will be equipped with “efficiency, comfort and capacity in mind”. It said that passenger facilities will be spread over three decks, and will include bars, restaurants and cinemas as well as a range of retail outlets. “This new cruise ferry provides Irish Ferries with a significant increase in both its freight and tourism carrying capacity on the fast-growing Dublin-Holyhead route,” the company said. Chief executive Eamonn Rothwell said that the investment “underpins the confidence that the group has in the markets in which we operate”. Email “A new €160m ferry between Dublin and Holyhead will be the biggest of its kind in the world”. Feedback on “A new €160m ferry between Dublin and Holyhead will be the biggest of its kind in the world”.